Oh woe is me – it was the last GBBO of 2013, and the last GBBO challenge blog post for me. I might have been feeling more sad about the end of this era of the blog, but I have been distracted by boiler problems, accepting a new job, and going on holiday. Well, after 20 hours of Gabriel the gas engineer practically living in my kitchen, the boiler is finally repaired, and we have hot water, central heating and no carbon monoxide poisoning now that the flue is working correctly – yay! If you live in North London / Herts and need a plumber, he’s your man. I also applied for, was offered, and accepted a new job at AXA IM – I am now going to be heading up social media for them – a slightly scary challenge considering we do practically no social media at the moment … but it’s going to be exciting, and I got the role thanks in no small part to this blog, which has helped me develop my own awareness of some aspects of social media which were lacking as I didn’t cover them at work. And even better, I have 2 weeks out of the office to recharge my batteries before I start my new role, so I’ll be spending a few days relaxing in London before heading to the sunny beaches of Mauritius to soak up the sunshine (would-be burglars note, my 18 stone, 6ft 5 brother with an evil streak will be staying at my house to look after the cats, so don’t bother). Apart from my usual fear of flying I am looking forward to the break, and so my next blog post may very well feature a bit about Mauritian cuisine, and show-off beach photos. But back to the Bake Off. The final episode included a wedding cake showstopper (yeah right), a picnic pie (yummy, I might have made that if I’d had more time) and pretzels. 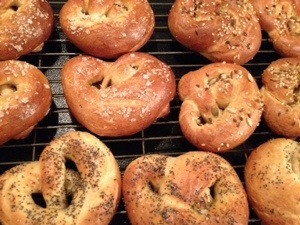 I loved the idea of making pretzels as I have never done so before, and surprisingly I had all the ingredients in my cupboards, except malt extract – but that was easy enough to buy from Holland & Barrett (although I think it’s quite commonly sold in most large supermarkets). I did ask my German colleague Ursula if she had a pretzel recipe I could borrow, but she said most Germans would never make their own pretzels as they can buy them on every street corner. She did however share with me a recipe she would use if she was obliged to make them, and I was intending to follow it until I noted the ingredients included lye, safety goggles and gloves! I am sure that I have read in horror novels about lye being used to dispose of bodies (as it dissolves them) … or maybe it’s used to make soap … I can’t remember, but it sounded scary, and as Paul Hollywood’s recipe involved just normal household ingredients, I decided to go for that instead. Sorry Ursula. 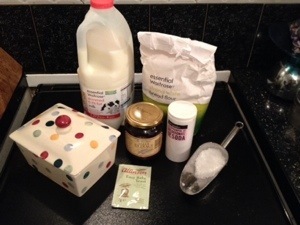 So I gathered together all my ingredients for the obligatory ingredients picture, and then got started on making the dough – it’s a lovely simple recipe mixing strong white flour, yeast, salt and butter with milk, into which you have dissolved malt extract. If you have a kitchen aid with a dough hook like me then it’s a total doddle. The dough unusually didn’t require any extra flour during the kneading process, nor did it when I rolled out the strips to make the pretzels. My dough doubled in size in around 1.5 hours in my proving cupboard (the tv cabinet) – I think it took a bit longer than the recipe stated because all of the ingredients are cold when they are mixed together, so there was nothing to get the yeast working on a cold October night. 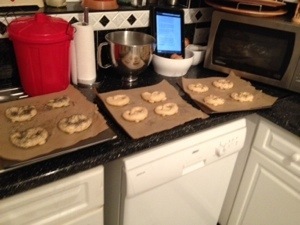 Once proved, I put a big saucepan of water on the heat to boil while I shaped the pretzels. Actually – don’t be daunted. 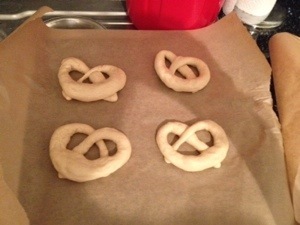 It’s surprisingly easy to shape the dough into pretzel shapes even though I have absolutely no hand/eye co-ordination. I just made savoury ones as I wasn’t keen on the idea of the sweet pretzels, so didn’t have two separate types of dough to play with. What I would recommend is that you really do stretch out the dough longer than you think. I probably stopped at 30cm thinking that would already be too thin, but in fact that length of dough ultimately made pretzel rolls like Frances more than the true pretzel (although they still tasted awesome). So stretch the dough out but then leave it for a few minutes before re-stretching it and shaping the actual pretzel … then it’s less likely to shrink back into a roll shape. As I mentioned, you don’t need more flour to roll out the pretzel, and in fact it works quite well if the dough slightly sticks to the worktop because they you are more likely to be able to stretch it out. So roll it out thinly (ideally, I believe, the middle should be thicker than the ends but I couldn’t manage that) to around 40cm long, and then hold it in front of you in a U shape, one end in each hand. Then flip it over itself, as if it were a skipping rope, and lay it on the worktop so that the U has turned upside down with you in between the two ends. Take the right end and stick it to the top left of the U, and take the left end and stick it to the top right of the U. Voila, you have your classic pretzel shape. If that doesn’t make sense, look on Youtube for how to do it, as I can’t think of another way to explain it! I didn’t see what difference the flip made to the dough, but it was easy (and quite fun) to do, so I maintained that approach for all twelve. As suggested by Paul, I laid each formed pretzel onto a baking tray lined with parchment, and once they were all ready my saucepan of water had reached boiling point. I then added the bicarb to the water (no idea where Paul gets his saucepans, but my saucepan barely held 3 litres of water so I added 10g of bicarb to that) and dunked the pretzels one at a time. Each pretzel is supposed to be in the water for 5 seconds – I found that was almost exactly the amount of time it took for the pretzel to float to the surface of the saucepan, and then I fished it out with a slatted spoon and dunked the next one. 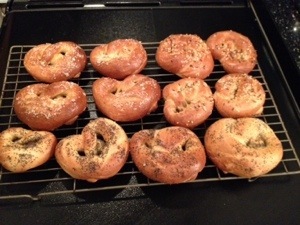 As all my pretzels were savoury, I topped 4 with poppy seeds, 4 with mixed seeds and 4 with sea salt. You slash the thick part of the pretzel with a knife and then bake them. Mine were ready after 20 minutes of baking in the oven at 200 degrees, and looked fabulous when cooked … even though they were definitely more roll-like than pretzel-like in appearance. However, I have a bone to pick with Mr Hollywood, because every single one of my pretzels stuck to the baking parchment like glue, and so I had to slice the bottom of each pretzel off when they had cooled. So my advice to you: don’t use baking parchment – lightly grease a baking tray or use a non stick one. Here’s Paul’s original recipe, or what I did is detailed below. Put the flour, salt, yeast and butter into a bowl. Dissolve the malt extract (very disappointing – doesn’t taste like the inside of maltesers as hoped) into the milk and add that to the dry ingredients. Mix thoroughly and then knead for around 10 minutes until smooth and elastic. Allow to prove for at least one hour until doubled in size. Put the water onto boil and preheat the oven to 200 degrees. 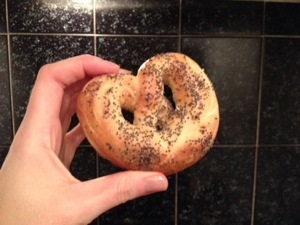 Divide the mixture into 12 equal sized pieces and shape each one into a pretzel shape (full details above). When the water boils, add the bicarb and then dunk each pretzel into the water for 5 seconds. Take out and place on a lightly greased baking tray (no baking parchment!!!) and sprinkle with your chosen topping while still wet. Slash a line into the thickest part of the pretzel and bake for around 20 minutes until golden brown. Cool on a wire rack. 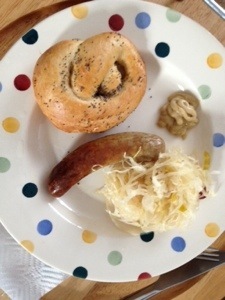 I served my pretzels German-style with bratwurst (there were no weisswurst in Waitrose, but Unearthed bratwurst are really excellent), sauerkraut and mustard. Beer would also be a good idea. I like my pretzels with a glass of wine!